Simple cakes that can be eaten as is with seasonal fruit are very appealing to a person who has no sweet tooth (me). I call them “amiable cakes” and I’ve posted a few examples in the past. This one, from Nigel Slater’s brilliant book, Appetite, is one of the best. (He’s a hoot – check out his column in The Guardian or his other books). 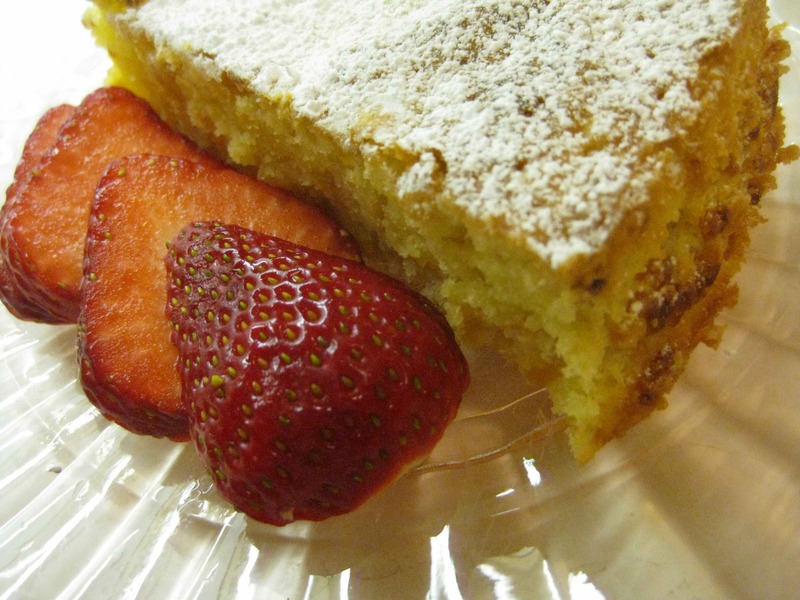 I made this cake at Easter and served it with terrific strawberries from California. I don’t often buy fruit that typically grows here but is out-of-season, but these babies were irresistible. The cake has a substantial texture, almost chewy, and sparky flavor from the tartness of the lemon zest and the sweetness of the apricots. 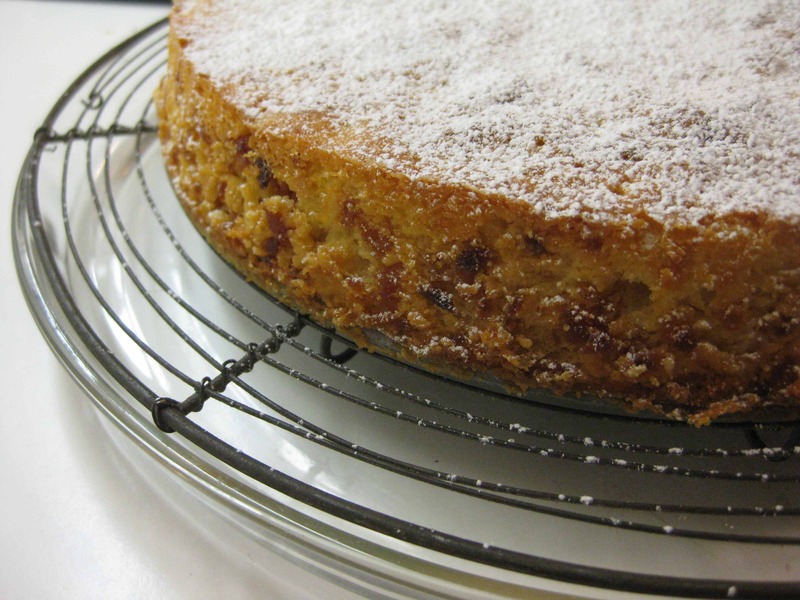 The texture is the result of ground almonds and finely chopped dried apricots. I have made the cake numerous times, and I’ve decided that I like the almonds crunchy so I don’t grind them to a paste or use pre-ground almond meal. Same with the apricots. However, since the ingredients contain no leavening agent, it is important to cream the butter and sugar until very light, and combine the ingredients in batches. Those instructions don’t make the recipe hard, but don’t expect a throw-it-in-a-pan approach or you’ll get a leaden cake. Preheat the oven to 350 degrees. Line the bottom of a 9-inch cake pan with parchment paper and lightly butter the sides. Grind the almonds in a food processor until they resemble coarse meal. Do not allow them to turn to paste. Measure ¾ cup. Add the flour and stir to combine well. Set aside. Grind the apricots in the food processor until they are finely chopped. Stop before they turn to paste. Grate the zest from the lemon and squeeze the juice. Combine the zest with the almonds and the juice with the apricots. Beat the butter and sugar with an electric mixer until very light and fluffy, about 5 minutes. Add the lightly beaten eggs to the butter and sugar mixture, a little at a time, continuing to beat it. With a large spoon or spatula, fold in the almond and flour mixture in three batches. Fold in the apricots and spread the batter in the prepared cake pan, smoothing the top. Bake for about 35 minutes or until lightly browned and firm to the touch. Test with a fine metal skewer; if it comes out clean, the cake is done. If not, bake a little longer.